1937--1954 Monthly, bimonthly New York, NY and Chicago, IL; Springfield, MA; New York, NY. Publisher: Bruns Publications, Inc.; Fox Publications, Inc; World Astrology, Inc.. Editor: Frank Y. Halls; V.S. Fox; "Rose Dawn"; Zariel; Zeus; B.C. Roberts; Elbert Benjamine; V.S. Fox; Katha Caldwell; Zariel; Zeus; B.C. Roberts; Elbert Benjamine, et al. 1/1, March 1937-14/11, February-March 1954. 128 pp. 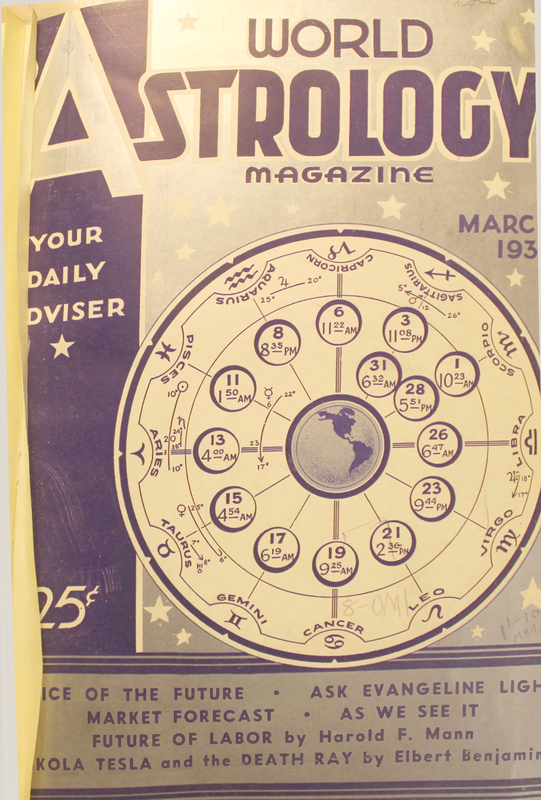 This was a rather typical prognosticative astrology magazine of the period, with monthly ephemeris, monthly predictions by astrological sign, tables of aspects, novelettes, etc. It is especially notable because it absorbed Rose Dawn's Modern Astrology in December 1937 and was for a time (May-September 19380 edited by her. On Rose Dawn, see the notes under Daily Meditation and Rose Dawn's Modern Astrology. It also published regular columns by Elbert Benjamine (under that name and as "C.C. Zain") and was edited by him at times, as well. There were regular advertisements in the journal during Benjamine's tenure for the lessons and meetings of the Church/Brotherhood of Light. NYPL; LOC.